As a Roblox developer it is currently impossible to look at the games page and feel fully satisfied with it. The most glaring issue with it is the Recommended sort which is just a mess of low quality games with a few popular games and Roblox-sponsored games(the Creator Challenges) thrown in to make it less of a mess. So I have come up with a proposition that will fix the recommended sort, implement the “popular by age group” change that Roblox has(or is going to) apply to the Popular sort, the “Popular Near You” sort, and the “Because you Liked ___” sort. The recommended sort currently seems like a jumble of some good games mixed with a lot of lower quality games. This is an issue because if players are trying to find new games to play this game sort offers nothing to them. They are better off looking at Popular, Top Rated and Featured sorts to figure out what are the best games on the platform. Additionally, when a new user signs up, their homepage shows just recommended games and their games page is just the recommended sort. Do we want all new users to play lower quality games and be turned away from the platform since the games don’t seem to be that awesome? No, of course not. We want new users to play some good games to get a good experience when they first join the platform, then they can choose what games to play and be confident that Roblox does indeed have a lot of good games. Additionally, the recommended sort seems to never update. I’ve had Pizza Factory, McDonald’s Tycoon, and YouTuber Tycoon at the top of my recommended sort for the last year or two. I’ve never played these games and I never play tycoon games, why am I being recommended these? On top of the recommended sort seeming like a mess, there are also other sorts which just seem to be alternative recommended sorts. The “Popular Near You” and “Because you Liked ___” sorts seem to just be recommending games. The “Popular Near You” sort seems like it’d be useful, but for anyone in the US the “Popular Near You” sort is going to be basically the Popular sort but with a few games in different orders. I’m sure in other regions the two sorts are also pretty similar as well. Sure, there could be a few games that don’t show up near the top of Popular sort, but those are not too common so I don’t see the point for having this category most of the time. The “Because you Liked ___” category tries to suggest games to you based on one of the games you’ve liked in the past. This sometimes leads to interesting results as @Quenty pointed out on Twitter. Sometimes it seems like this sort does a good job of recommending games in the same genre, but as seen in Quenty’s tweet sometimes it just misses the mark completely. On top of this, this sort doesn’t pop up all too often, so whenever it does pop up and is bad it is very noticeable. 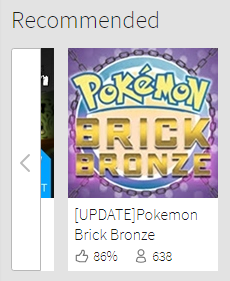 This doesn’t leave a good impression on Roblox’s users if they are being recommended some pretty bad or empty places by Roblox. The sorts I have mentioned above should all be combined into the Recommended sort. This would always be visible on the games page under the featured sort. The new Recommended sort would be a mixture of games popular in your age group(which Roblox either has or was planning to do with the popular sort), the “Popular Near You” sort, because I believe this category still has some use to it, the “Because you Liked ___” sort, and the current Recommended sort. The popular by age group game recommendations would have to be improved to recommend games based on your age not just <13 and 13+. I am 20, I don’t have the same taste in games as people that are 13-15. On top of this, some of the games I would be recommended would be based on games I’ve liked, which should go by recently liked games, not just any of a user’s liked games. This would stop any games like a game being made for the 2017 game jam from showing up since I probably haven’t played it in a while. I’ve had positive experiences with the “Because you Liked ___” sort so I would like to see that kept around in some capacity. To further improve the Recommended sort, it could also have a pool of all past featured games to choose to display to a user. The Featured sort is changed out on a cycle and games are usually removed after 2-4 weeks on the Featured sort. These games should still be recommended to the user somehow since they are obviously high-quality games, so why not allow them to show up in a user’s recommended sort? One other feature that I would like to see introduced would be an option to have the recommended sort not recommend certain games anymore. One game keeps showing up that you know you are never going to play? 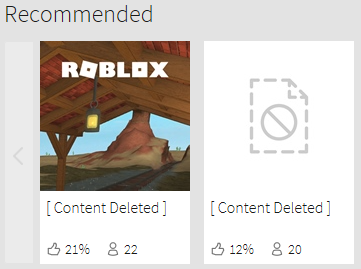 Click a button to let Roblox know you don’t want to be recommended to play it anymore and it won’t show back up. This would allow the user to make the featured sort a little more personalized. An option could be added to the account settings page to clear the recommended sort blacklist so that users can reset the recommended feed to the default in case they accidentally hid a game. So why is this necessary? Well to improve the Recommended sort to recommend games that are higher quality and to remove other sorts that just seem like rehashes of the Recommended sort. This would provide new users with a list of games that are fairly high quality so that they can see how good Roblox games can be. This would also make the recommended sort useful rather than being a list of games at the bottom of the page that nobody seems to pay much attention to and make developers feel like being in the recommended sort would really boost their games. I think us developers should be able to choose recommended games for our places… You know, the ones that show up at the bottom of the page. If a player spends a lot of time on our game they will see some of our recommendations appear in their recommended. This way we can get players into other games we have made and stop having stuff we don’t support taking valuable players off our game’s page. I’d imagine players’ recommended sort would actually be of interest following such a change. So this showed up in my recommended. Based on the thumbnails I thought it’d be some terrible free-modeled game… turns out it’s just a straight up reupload of Pokemon Brick Bronze. So, Pizza Factory (my game) just dropped off the top of recommended for like the first time in about 6 months. Although I don’t really mind about this, since I don’t really know why it was the top of recommended in the first place. Although, now, some clothing store with 50% thumbs up and poor building quality seems to have popped up there. Is this the same for anyone else? I doubt new users would be interested in this at all. I think the easiest change they could do is keep their current recommended algorithm (which is rumored to be about player retention), while adding the case that each game needs to have a 70% rating or more to be shown on the page. To go into more detail, that rating would need to be differentiated by platform and due to the nature of really large numbers and all time ratings being stuck after awhile, make it a rolling average that determines if your game makes the 70% cutoff. Because recommended feels like such a lottery system, why are they rewarding poorly rated games at the expense of higher rated but still highly recommended games? Not sure what they base it on at all. But I agree with you, it should be platform based, and also could be more transparent to avoid the “lottery” you speak of.